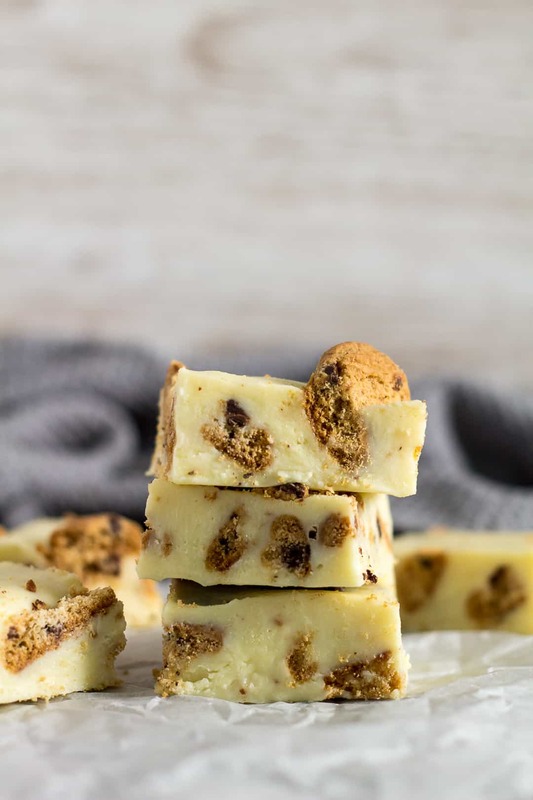 Milk & Cookies Chocolate Fudge – Incredibly creamy and fudgy white chocolate fudge loaded with mini chocolate chip cookies. Only 4 ingredients, and is made in the microwave! 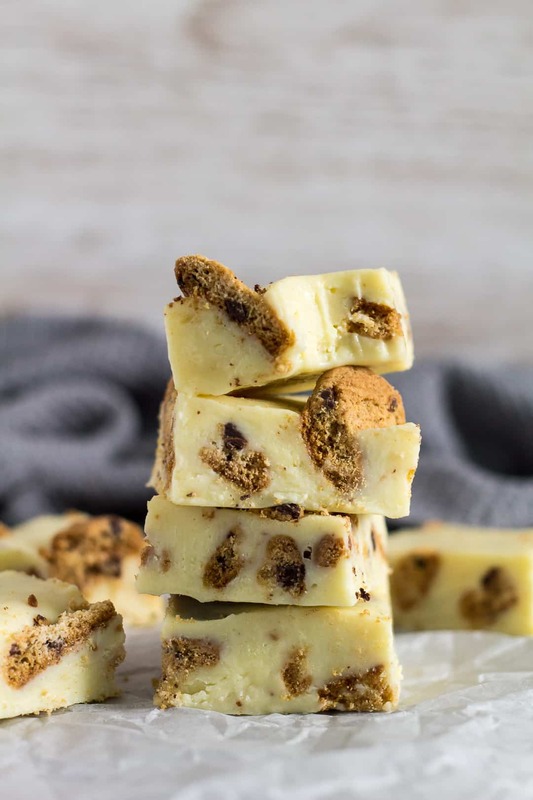 If you’ve checked out my other fudge recipes, you’ll know I love making quick and easy microwave fudge. It’s convenient, and they come out absolutely delicious – so creamy and fudgy! Today, I bring you my milk & cookies chocolate fudge. 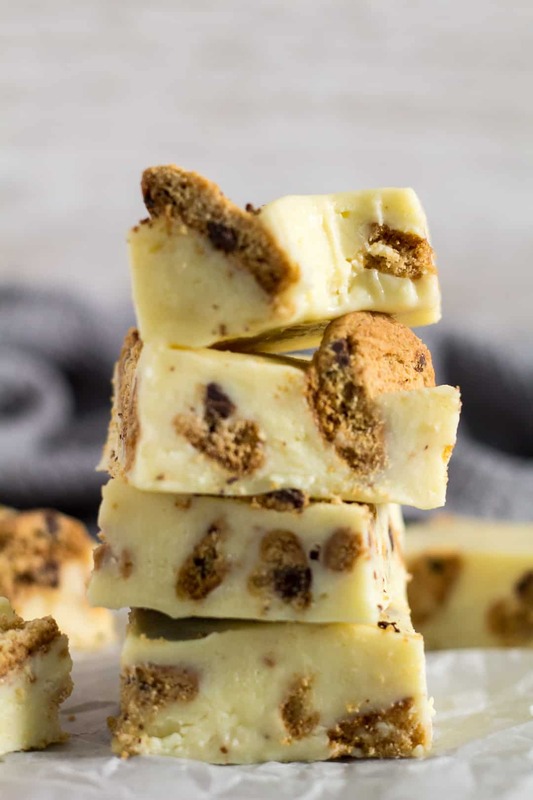 Yes, white chocolate fudge stuffed full of mini chocolate chip cookies – what’s not to love here? This recipe consists of only 4 simple ingredients. Grab your white chocolate, break it up into pieces and add to a microwave-safe bowl. Heat in 20 second intervals until melted and smooth. Be sure to stir after each interval. Once melted, add the sweetened condensed milk and vanilla, and stir in until nearly combined. Fold in about 18 mini cookies – some chopped, some whole. Spread the mixture into an 8×8-inch square baking pan lined with parchment or foil, then smooth out the top. If desired, top with even more mini chocolate chip cookies. Refrigerate until set – about 4 hours or overnight. Once set, slice into adorable little squares! By the way, how cute are those mini chocolate chip cookies?? 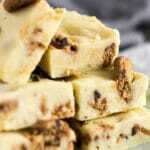 More fudge recipes to try! 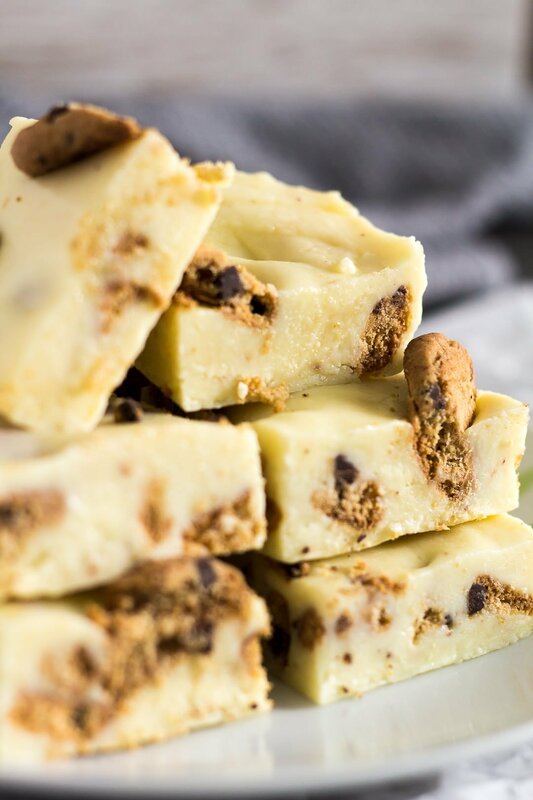 Incredibly creamy and fudgy white chocolate fudge loaded with mini chocolate chip cookies. Only 4 ingredients, and is made in the microwave! Place the chocolate into a large microwave-safe bowl, and heat in 20 second intervals, stirring after each one, until melted and smooth. Stir in the condensed milk and vanilla until almost combined. Fold in the mini cookies. The mixture will be very thick. Spread the mixture into the prepared pan, and smooth out the top. Top with extra mini cookies, if desired. Refrigerate for 2 - 4 hours or overnight until completely set. I cut my fudge into 16 bars for the photos, which would be 289 calories each. Okay, fudge stuffed with cookies? I am totally in! Looks like such an amazing sweet treat Marsha!